AGE: Age: 10+; MPAA Rating — PG; Drama; 2004; 135 minutes; Color. Available from Amazon.com. AGE: Age: 10+; Not rated but suitable for any age; Documentary; 2003; 60 minutes; Color. Available from Amazon.com. 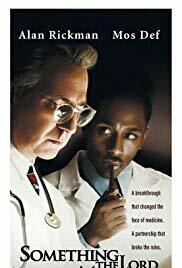 These films describe the unique and productive association between Vivien Thomas, a black high school graduate, and his white mentor and employer, Dr. Alfred Blalock. For more than 30 years, the two men pursued a variety of medical research projects. In 1944, in association with Dr. Helen Taussig, they designed and carried out the first blue baby operations. These procedures have saved tens of thousands of lives world-wide. The success of the blue baby operations confirmed that surgeons could operate on a living human heart. Afterwards, Thomas trained young doctors at Johns Hopkins Medical School in methods of heart surgery. While a mid-20th century interracial partnership in the field of medical research and an important medical breakthrough are each worthy of note, there is much more to this story. Vivien Thomas fully participated in developing the blue baby operations, but he was not given credit for his contribution nor was he acknowledged to be a leading instructor of surgery for more than three decades. Why it took so long for Thomas to receive the recognition he deserved provides an excellent window into changing attitudes concerning race in the U.S. during the 20th century. “Something the Lord Made” is a fictionalized account that accurately conveys the sense of the actual events. “Partners of the Heart” is an excellent PBS documentary. Featured Actors: Alan Rickman as Alfred Blalock; Mos Def as Vivien Thomas; Mary Stuart Masterson as Dr. Helen Taussig; Kyra Sedgwick as Mary Blalock; Merritt Wever as Mrs. Saxon; Doug Olear as Michael Saxon. The story of Vivien Thomas and Alfred Blalock is an excellent paradigm for the study of racism in the United States during the period 1930 – 1980. It provides a graphic example of the interplay between altruism and self-interest in race relations. It shows doctors from different disciplines cooperating to make an important medical breakthrough and describes a pivotal time in the development of heart surgery. The story of the blue baby operations introduces three important medical researchers of the 20th century: Vivien Thomas and Drs. Alfred Blalock and Helen Taussig. Each movie has its strengths. “Something the Lord Made” is excellent in every respect: acting, screenwriting, directing, set design, music, and in its ability to use drama to convey a realistic view of what actually occurred. The documentary, “Partners of the Heart,” is also very interesting. It contains sections on Nashville and its black community absent from the fictionalized version. The documentary has excellent special features. Both films are enriching. On the whole, TeachWithMovies.com recommends the dramatic version. MINIMAL. In “Something the Lord Made” there are four or five occasions in which the character of Dr. Blalock used profanity. Apparently, this is realistic. If you show your child “Something the Lord Made” tell him or her that all of the important points of the film accurately portray the events as they occurred. Ask and help your child to answer the Quick Discussion Question. Vivien Thomas graduated with honors from Nashville’s Pearl High School in 1930. He was 19 years of age and wanted to become a doctor. A skilled carpenter, he planned to finance his college education with money saved from seven years of carpentry jobs. The bank that held his savings failed the summer after he graduated and the young man’s hopes for college were dashed. With the Great Depression making carpentry work scarce, he thought himself lucky to find a job as a janitor. However, Vivien Thomas was luckier than he thought. His employer was Dr. Alfred Blalock, a medical research scientist at the Vanderbilt University Medical School. Dr. Blalock soon realized that this young black man could be much more than a mere janitor. Judging the new janitor by his abilities, rather than by the color of his skin, Dr. Blalock found that his employee showed immense talent as both a scientist and as a surgeon. Dr. Blalock trained Vivien Thomas in medical research and surgery and soon the youth became Blalock’s chief research assistant. They would discuss the scientific problems that Dr. Blalock was trying to solve and together design experiments. Mr. Thomas would, for example, operate on dogs to recreate the conditions that Dr. Blalock was studying and then record the results of experiments searching for a cure for those conditions. During the mid-20th century, Dr. Blalock was the only medical researcher to give this much opportunity and responsibility to a black man with high school education. Mr. Thomas and Dr. Blalock worked together at Vanderbilt University from 1930 to 1940. When Dr. Blalock was offered the post of chief surgeon at Johns Hopkins Medical School in 1941, he insisted that a job be offered to his research assistant as well. They worked together at Johns Hopkins from 1940 until Dr. Blalock’s retirement in 1963. Mr. Thomas was so talented and knowledgeable that at Johns Hopkins he was asked to train young doctors in the techniques of surgery. Until 1944, the heart was considered off-limits to surgeons. This was disproved by Dr. Blalock in the famous blue baby operations. Vivien Thomas made major contributions to every phase of the development of these procedures. He surgically created in dogs the heart malformations that caused the blue baby syndrome. He worked with Dr. Blalock to develop a revolutionary shunt which mitigated the effects of these deformities. It was Vivien Thomas who repeatedly tested the surgery on the dogs whose hearts he had modified. He invented a clamp necessary for the operation. Finally, standing on a step stool and looking over Dr. Blalock’s shoulder, Mr. Thomas supervised the first 25 – 35 operations that Blalock performed on human beings. Partners of the Heart by Vivien Thomas, p. 102. Yet, Dr. Blalock, who came from a wealthy Southern family, never paid Vivien Thomas a salary commensurate with his responsibilities or his contribution. He never encouraged his assistant to return to school and obtain a medical degree. Dr. Blalock never accepted Mr. Thomas as a social equal nor did he place Mr. Thomas’ name on scientific articles about the treatments that he helped develop. (Scientists usually gain recognition when their names are placed on published papers that describe their research.) Vivien Thomas’ leading role in the groundbreaking blue baby operations was not publicly acknowledged by Dr. Blalock or by Johns Hopkins for decades. Had Mr. Thomas been a physician, he most likely would have been one of the premier surgeons in the country. 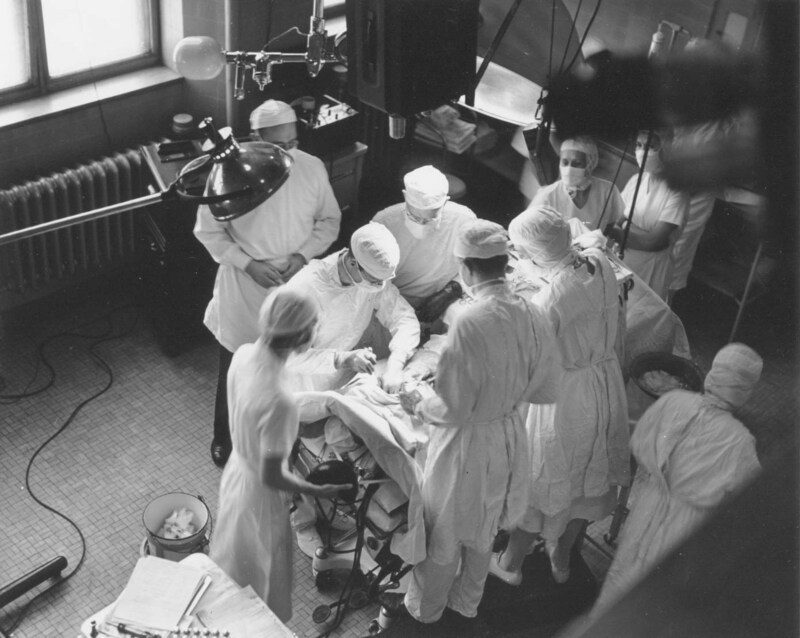 After Dr. Blalock’s retirement in 1963, Mr. Thomas remained as head of the Johns Hopkins surgical research laboratories and continued to instruct doctors training to be surgeons. It was not until 1976 that Mr. Thomas was given an honorary doctorate by Johns Hopkins and appointed to be an instructor of surgery. In 1979, upon his retirement, Dr. Thomas was appointed instructor emeritus of surgery. The doctors who Dr. Thomas helped to train, including some of the most prominent surgeons in the country, commissioned his portrait and saw to it that the painting was placed next to Dr. Blalock’s portrait as an honored member of the Johns Hopkins staff. Dr. Vivien Thomas is now recognized as a full participant in the development of blue baby operation. Maryland was a Border State during the Civil War and racially segregated in the period 1940 – 1965. There was no reduction in the restrictions that segregation placed on Vivien Thomas and his family when they moved north from Nashville in 1941. Open heart surgery is any surgery in which the chest wall is opened to reveal the heart. The term “open” refers to the chest not to the heart itself. Open heart surgery includes surgery on the blood vessels leading to and from the heart. One measure of the progress in Civil Rights in the United States is that in 2004, more than 11 percent of the medical students at Johns Hopkins University Medical School were black. Johns Hopkins has established the Vivien Thomas Fund which is “committed to reaching out aggressively to under-represented minorities to ensure the broadest possible talent pool in academic medicine and biomedical science.” There is also a Vivien Thomas Young Investigator Award established by the Council on Cardio-thoracic and Vascular Surgery to acknowledge the accomplishments of young investigators focused on fundamental and applied surgical research. The Vivien Thomas Research Program brings promising high school students to Morehouse College for six weeks during the summer. The students conduct experiments under the direction of a medical school faculty member, learning the process and methodology of scientific research. This story provides examples of the impact of the Great Depression. The reason that Mr. Thomas and his fiance, Clara, were so happy that he had gotten a job, even a job as a janitor, was that jobs were hard to come by during the Great Depression. The failure of the bank where Mr. Thomas put his money is an example of one of the worst effects of the Great Depression. Banks, having invested their depositors’ money in businesses that went under or in real estate that had depreciated in value, became insolvent and simply shut their doors. The depositors could not get their money. That doesn’t happen at the present time because the federal government insures deposits in banks up to a certain level. Federal deposit insurance was a reform begun to correct the type of bank failure that took away the life savings of Vivien Thomas’ and many other Americans. Note that as of July 2016 evolving standards of ethics in the treatment of animals and advances in simulator technology have led all medical schools in the U.S. to abandon the use of animals in the first four years of medical education. See Last US Medical School That Used Live Animals In Teaching Surgery Ends Practice” and Announcement by Physicians Committee for Responsible Medicine. ALFRED BLALOCK, M.D. (1899-1964) Dr. Blalock earned his medical degree at Johns Hopkins in 1922. He served as the first resident in surgery at the new Vanderbilt University Hospital and stayed on as professor of surgery until 1940. At Vanderbilt, Dr. Blalock focused his research on the cause of traumatic shock. He discovered that people went into shock due to loss of blood or other fluids. Based on his findings Dr. Blalock urged wider use of plasma or whole-blood transfusions to improve treatment for surgical shock. These treatments saved countless lives during WWII and thereafter. Vivien Thomas came to work for Dr. Blaylock as a janitor at Vanderbilt, and it was there that Dr. Blaylock trained Vivien Thomas in scientific research and surgery. In 1941, Dr. Blalock returned to Johns Hopkins as surgeon-in-chief at its hospital and director of the surgery department at the medical school. He served there until his retirement in 1963. One of the conditions that Dr. Blalock set when he accepted employment at Johns Hopkins was that a position be created for his lab technician and research assistant, Vivien Thomas. At Johns Hopkins, Dr. Blalock, Vivien Thomas, and Dr. Helen Taussig, a pediatric heart specialist, developed a shunt technique to treat blue baby syndrome. The success of this operation demonstrated that surgery on the heart was possible. Dr. Blalock was elected to the National Academy of Sciences and awarded numerous honors including the Chevalier de la Legion d’Honneur. DR. VIVIEN THOMAS (1910 – 1985) Born in Louisiana and raised in Nashville, Tennessee, Vivien Thomas began to work for Dr. Blalock in 1930 at the age of 19. He never fulfilled his dream of becoming a doctor, but he was able to develop his talents as a scientific researcher and surgeon and make important contributions to science. His association with Dr. Blalock was one of the most productive partnerships in the history of medical research. Given an honorary doctor of laws (Johns Hopkins did not give honorary doctorates in medicine), he became an instructor of surgery at Johns Hopkins Medical School. He retired in 1979 and was awarded emeritus status. Dr. Thomas’ autobiography, Partners of the Heart was published a few days after his death. HELEN B. TAUSSIG, M.D. (1898-1986) One of the most influential female doctors of the 20th century, Dr. Taussig overcame severe dyslexia, prejudice against women, and, soon after she graduated from medical school, deafness. Dr. Taussig was an early female graduate from Johns Hopkins Medical School. She chose pediatric cardiology as her specialty. Upon graduation, Dr. Taussig was assigned a job no one wanted, directing the Pediatric Cardiology Clinic at Johns Hopkins. Located in the dreary basement of the hospital, the clinic served extremely ill children. Her work in the clinic gave Dr. Taussig the opportunity to see hundreds of blue babies, children who had deformities of the heart that prevented much of their blood from reaching their lungs. These children were exhausted by any activity and many could not walk. They usually died at a very young age. After graduation from medical school, Dr. Taussig had to contend with the loss of her hearing. Determined not to let this condition stand in her way, she learned to read lips and “listened with her fingers” to her patients’ hearts. Over time she realized that her young patients were blue because not enough oxygen was reaching their blood. Dr. Taussig suggested various operations to improve circulation to the lungs. After another surgeon had turned her down, Dr. Taussig suggested to Dr. Blalock that a surgical solution could be found. On November 19, 1944, as the Second World War raged in Europe, and after years of preparatory work performed primarily by Vivien Thomas, Dr. Blalock operated on a baby near death from blue baby syndrome. Another major contribution by Dr. Taussig was her role in preventing large numbers of thalidomide-caused birth defects in the United States. Shortly after an epidemic of children born with flipper-like limbs, heart defects, and other malformations broke out in Europe, a student told Dr. Taussig about a possible link between the defects and thalidomide. The drug was a tranquilizer that had been aggressively marketed in Europe. U.S. physicians were only beginning to prescribe it. Thalidomide had been thought to be very safe. Dr. Taussig quickly went to Europe and determined that the claims of a link between the birth defects and thalidomide were most likely genuine. She returned to the U.S. and spread the alarm. Dr. Taussig is credited with preventing large numbers of birth defects from thalidomide in the U.S.
Dr. Taussig received many awards, including the Presidential Medal of Freedom, the highest award that can be given to a civilian. From 1930, when Vivien Thomas first applied to Dr. Blalock for a job as a janitor, until well into the 1950s, black people in the South were not permitted to use their creativity to contribute to scientific research. Dr. Blalock gave Vivien Thomas that opportunity. Viewing the young man as a person, rather than as just another black janitor, Dr. Blalock encouraged him to develop his skills as a scientist and as a surgeon. This enabled Mr. Thomas (later Dr. Thomas) to contribute to society and to partially fulfill his potential. In the laboratory, Vivien Thomas was always treated as an individual and with respect. For example, he was allowed to use the same toilet as all of the white lab workers and doctors. This was a mark of equality not achieved in the general society until the 1960s. Another example of this problem is shown in Hidden Figures. However, Dr. Blalock never fully acknowledged his assistant’s contribution and claimed the results of Mr. Thomas’ creativity as Blalock’s own. Although Vivien Thomas was clearly Dr. Blalock’s equal as a surgeon, Dr. Blalock never acknowledged this. Nor did Dr. Blalock permit Mr. Thomas to play a role as a social equal outside of the lab. Perhaps Dr. Blalock’s most egregious failure in his relationship with Vivien Thomas was that Dr. Blalock never encouraged or helped Thomas to go back to school and fulfill his dream of becoming a doctor and a surgeon. In Dr. Blalock’s defense, it should be noted that society was probably not ready to treat Vivien Thomas as an equal to white doctors until the 1960s and 1970s. Had Dr. Blalock fully disclosed Mr. Thomas’ role in the 1930s and 1940s and insisted that Mr. Thomas get credit for his work, both of them may have suffered. Mr. Thomas might have had to leave his job as Dr. Blalock’s research assistant. Societal norms changed drastically in the period from 1955 to 1980. (Dr. Blalock retired in 1963 and died in 1964.) Blalock, like anyone else, should be judged as a product of his times. It is not fair to judge what Dr. Blalock did between 1930 – 1965 based on how blacks were treated after 1965. Nonetheless, the ethics of the scientific community require that those who do the work get the credit. The procedure pioneered by Drs. Blalock and Taussig by which blue babies are temporarily given increased blood flow to the lungs so that they can live long enough for additional surgery to more permanently correct the function of their hearts is called the Blalock-Taussig Shunt. Some in the medical research community have asserted that the shunt should be renamed in honor of Vivien Thomas. See, “Has the time come to rename the Blalock-Taussig shunt?” by Brogan, Thomas V. MD; Alfieris, George M. MD, Pediatric Critical Care Medicine. 4(4):450-453, October 2003. “Something the Lord Made” is an excellent example of a film that faithfully describes major events, captures the spirit of the times, and gives an honest portrayal of the people involved. While minor events have been rearranged and some scenes were invented to advance the storyline, this drama is accurate from the general historical and emotional standpoint. Race relations, the personalities of the two men, their work together, the state of medical research … are accurately presented in the movie. We have not been able to find any basis in the historical record for the scenes in Something the Lord Made between Vivien Thomas and his wife and family or for the scenes between Alfred Blalock and his wife and colleagues. In addition, there are a number of scenes in which facts have been changed slightly but which reflect the essence of the factual situation. At the beginning, the sequence of events by which young Vivien Thomas came to work for Dr. Blalock is mixed up a bit. The party scenes have been transformed from a birthday party for Dr. Blalock to which Mr. Thomas was not invited to a dinner celebrating the blue baby operations. Vivien Thomas never left Blalock’s employ. The incident in the film that has him quitting, selling pharmaceuticals, and then having to ask to be rehired is a way to dramatize the importance to him of the work and the fact that he was underpaid. Mr. Thomas did have to moonlight for a short time selling pharmaceuticals to doctors and he did have to complain to Dr. Blalock of his need for more money before Dr. Blalock increased his salary. The comment by Dr. Blalock that Mr. Thomas’ surgery was like something the Lord made, occurred when the doctor did an autopsy on a dog whose heart had been altered by Vivien Thomas to mimic a congenital defect that they were studying. Thomas, pp. 122 & 123. The last time Dr. Thomas saw Dr. Blalock, the older man’s back was in such poor shape that he walked at a 45 degree angle, obviously in pain. Thomas, p. 214. This was not shown in the corresponding scene in the film. Another (so far as we can tell) fictional scene is the final scene with Dr. Blalock. Just before he gets out of the wheelchair and walks stiffly out of the hospital, Dr. Blalock begins to talk about his regrets, but stops. The only regrets that relate to the film would be due to Dr. Blalock’s failure to encourage and help Mr. Thomas to become a surgeon. This is a dramatic way of raising this issue. None of these inventions or inaccuracies change the important elements of the story and all serve to advance the plot or highlight the lessons to be learned from the real story. There are 25 questions (at four points each) suggested for classes that have seen “Something the Lord Made” and 19 Questions (at five points each) for classes that have watched “Partners of the Heart”. For versions of the test/assignment suitable to be passed out to students, see Something the Lord Made Comprehension Test/Homework Assignment and Partners of the Heart Comprehension Test/Homework Assignment. The information covered in this test/homework assignment is contained in the Helpful Background section and the movies. This web page serves as the answer key for the test/homework assignment. 1. Describe the two reasons why Mr. Thomas operated on the hearts of dogs in Dr. Blalock’s research laboratory when he was preparing for the blue baby operations. To recreate heart defects and to develop surgical treatments for those defects. 2. How did Mr. Thomas lose his college savings? The bank in which he put his money failed during the Great Depression. 3. Can depositors in most banks in the U.S. today lose their money if the bank fails? Give reasons for your answer. No. Today almost all banks have Federal deposit insurance which protects deposits up to the amount of $100,000. 4. Why was it difficult for Vivien Thomas to get a job once he had decided that he was not going to be able to go to college? It was the beginning of the Great Depression and jobs were scarce. 5. How do scientists get recognition for their scientific research? Their names are placed on the papers that describe their research. 6. Was Dr. Blalock a racist or a man who did as much as he could to help Vivien Thomas have a fulfilling career? There is no one right answer to this question. We tend to take the more charitable view of Dr. Blalock’s actions. A good answer will refer to the facts that: (1) Most white doctors in the South in the 1930s and 40s would not have trained a black man with only a high school education to become a full-fledged participant in pioneering scientific research. In addition, Thomas was treated with respect in many other ways. He was, for example, allowed to use the same toilet as all of the white lab workers and doctors. (2) However, Dr. Blalock did not treat Thomas as an equal beyond the walls of the laboratory or operating room. He did not give Thomas credit for his work in the scientific community. He did not invite Thomas to social gatherings. He did not encourage Thomas to attend college and then go to medical school. Dr. Blalock did not pay Thomas a salary commensurate with his work. In these respects, Dr. Blalock took advantage of the color of Thomas’ skin. (3) We must be careful not to judge Dr. Blalock by current standards. After he retired in 1963, there was a major shift in thinking about racism and the rights of black people, particularly in the South. 7. What role did racism play in the fact that Dr. Blalock was able to keep Vivien Thomas as a lab assistant for so many decades and benefit from Thomas’ work without giving him credit? It played a large and probably a primary role in preventing Mr. Thomas and others from demanding that Mr. Thomas have the opportunity to go to college and later get a medical degree. The same is true of Dr. Blalock’s failure to give Mr. Thomas credit for his contribution to Dr. Blalock’s discoveries. 8. Leaving aside the question of whether Dr. Blalock should have encouraged Mr. Thomas to attend college and become a surgeon, describe why the Blalock/Thomas team is an example of effective teamwork. They each contributed their abilities and capacities to a common effort. They each suggested solutions to problems and were proud of each other’s contributions. 9. In the Blalock/Thomas team effort, did one of the team members benefit more than the other? There is no one right answer to this question, although most will probably say that Dr. Blalock derived more benefit than Mr. Thomas. A good answer will point out at least the following two facts: (1) Dr. Blalock received the larger salary and the kudos as the scientist who discovered new treatments. (2) There was no other black person that we know of who was trained or permitted to play the important role that Mr. Thomas played in scientific research in the South during the 1930s to 1950s. 10. Did Dr. Blalock act in a caring manner toward Mr. Thomas? There is no one right answer to this question. A good answer will include a reference to the concept of nurturing. One of the main components of caring is to nurture another individual. Dr. Blalock was nurturing to Mr. Thomas in that he trained him to be a research assistant and surgeon. However, true nurturing behavior would have resulted in Dr. Blalock encouraging Mr. Thomas to go to college and then, if Mr. Thomas so desired, to medical school. True caring, like true friendship, would have resulted in Dr. Blalock giving Mr. Thomas credit for his efforts in the blue baby operations. Still, Dr. Blalock did a lot for Mr. Thomas, in return for what Mr. Thomas did for him. In addition, what Dr. Blalock did for Mr. Thomas was much more than most Southerners would have done for a young black high school graduate in period 1930 – 1960. 11. Was the blue baby surgery performed by Dr. Blalock full open heart surgery? Yes. Open heart surgery is any surgery in which the chest wall is opened to reveal the heart. The term “open” refers to the chest, not to the heart itself. Open heart surgery includes surgery on the blood vessels leading to and from the heart. 12. Why did Vivien Thomas cause such a controversy when he went out of the lab in his white lab coat? White lab coats were worn by doctors or people performing a task that required expertise. White people at Johns Hopkins were unused to a black man taking on such a role and they felt insecure when Mr. Thomas appeared in a white lab coat. Some blacks probably thought that Thomas was acting above them and resented it. 13. It is said that Vivien Thomas opened new paths to healing when most doors were closed to him. What is meant by that? Thomas helped pioneer heart surgery, when the common wisdom among doctors was that it was impossible to work on the heart. At the same time, because of segregation, there were many opportunities that were not open to Mr. Thomas. 14. Why was cardiac surgery referred to as the “Mount Everest” of medicine before November of 1944? The constant pumping of the heart is necessary for life to continue. A 90 second interruption in blood flow to the brain would destroy it. Before Drs. Blalock, Taussig and Thomas, no one had demonstrated that major surgery on the blood vessels of the heart was possible. 15. What did Dr. Blalock see in Vivien Thomas a few weeks after Thomas began to work for him? That Thomas was talented and that he was someone Dr. Blalock could train to be a good lab technician. 16. Dr. Levi Watkins, one of the first black graduates of the Johns Hopkins surgery program said this about Vivien Thomas: “I think he is the most untalked about, unappreciated, unknown giant in the African American community. What he helped facilitate impacted people all over the world.” Given the fact that Vivien Thomas never participated in a demonstration demanding civil rights or filed a lawsuit to enforce his rights, what did Dr. Watkins mean? By working at the cutting edge of medical research, becoming an expert in surgery, and inventing new surgical techniques, Vivien Thomas demonstrated that blacks could perform surgery and conduct scientific research as well as any white man. This was another advance in the demonstration that blacks were not, in any way, genetically inferior to whites. Questions Relating to "Something the Lord Made"
17. Do you agree with the priest that Dr. Blalock was being arrogant and had embarked on a vain quest for glory by operating on the heart of a blue baby patient? Modern secular Western society would clearly answer the question in the negative. Modern medicine’s wonder treatments are now routine and actually expected. 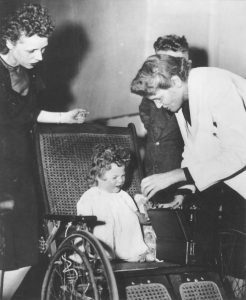 Many religious people would take the position taken by Eileen’s mother, that the operation itself and the possibility of the operation was an expression of God’s will. However, this issue is one of belief and there are a few people who would still answer the question in the affirmative. 18. Was the first blue baby operation an experiment, as the priest charged? Yes, it was an experiment. It was ethical because the child would have died without the operation. The fact that the operation was experimental should have been (and probably was) fully disclosed to the parents when they were making their decision about whether to give their consent. 19. Was the priest right that Dr. Blalock was arrogant and vain? There is no one correct response to this question. A good answer would point out that taking risks and being on the forefront of research in any field could be called arrogant. 20. Remember the discussion between Harold, Vivien’s brother, and their father about what it took to improve the situation of blacks in America? The father pointed out that Harold, the grandson of a man born into slavery, had a college education. He used this as proof that things were getting better and that Harold didn’t have to put himself at risk by being a plaintiff in a lawsuit seeking equal pay for black teachers. Harold contended that change in society didn’t occur unless people made the changes happen. This required, he argued, that people on occasion put their futures on the line. Who do you agree with? The right answer is that even if injustice will be corrected gradually, in most cases, people must compel a change to occur or it will never happen or it will happen too slowly. 21. Compare the contributions to the Civil Rights Movement of Vivien Thomas and his brother Harold, who was a plaintiff in a landmark case that went all the way to the Supreme Court. That case established that black teachers had to be paid the same amount as white teachers for the same work. There is no one right answer to this question. A good answer will note the broad impact of the contributions of both men. 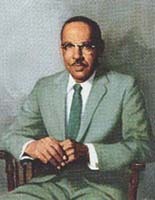 Vivien Thomas’ role was more unique than the role played by his brother. However, both were essential and important. 22. Was Dr. Blalock’s colleague correct when he worried that Blalock was rushing into the first blue baby operation because Dr. Blalock had prematurely assured the child’s parents that he knew how to perform the operation? The doctor had a point, but Blalock had other considerations as well, most importantly, that the child would die without the operation. It was her only chance. 23. One of the most important ethical obligations for a doctor is to make sure that his or her treatments do no harm. Did Dr. Blalock violate that obligation by rushing into the first blue baby operation after he had performed only one trial surgery on a dog? The fact that Blalock was successful is not an answer to this question because Dr. Blalock had to answer it for himself and for his patient before the operation. At that point he didn’t know whether it would be a success or not. The important point is that the child would surely have died very soon without the operation. This allowed Dr. Blalock to take the risk of doing harm to his patient and still act in an ethical manner. 24. After Dr. Blalock and Dr. Taussig took full credit for the operation and didn’t given Mr. Thomas any credit, the character of Vivien Thomas in the movie says to Blalock: “I’m invisible to the world. I don’t mind that. I understand that. I thought it was different in here.” What did he mean? Thomas and Blalock had, in effect, set up a separate world in the laboratory in which they treated each other without consideration of their respective races. This did not extend to outside the laboratory, but Thomas felt that the blue baby operations were so important that it should have. He was right. 25. At the end of the film, Dr. Blalock says to Mr. Thomas, “They say you haven’t lived unless you have a lot to regret. I regret …. I have some regrets. But I think we should remember not what we lost but what we’ve done … all the lives we saved and we did. We saved plenty didn’t we Vivien?” What do you think that Blalock was talking about? Not sharing the acclaim for the blue baby operations with Thomas and not helping Thomas go to college and medical school to become a surgeon. Questions Relating to "Partners of the Heart"
17. Why was Nashville different than other Southern communities before the advent of the Civil Rights movement? It had a large elite class of black middle-class professionals and merchants, with black doctors, lawyers, store owners, and entrepreneurs. The residents of Nashville’s black middle-class enclave created a world of their own. Black firemen secured the neighborhoods. Black doctors cared for the sick. It was not charting new ground for Vivien Thomas to dream of becoming a doctor. 18. What did Mr. Thomas say to Dr. Blalock when Dr. Blalock lost his temper and cursed at him and how did Dr. Blalock respond? Thomas resigned saying that he had not been raised to take that kind of language. Dr. Blalock promised that it would never happen again, and it didn’t. 19. It was said of Mr. Thomas and Dr. Blalock that “In the privacy of the lab, they made the rules. Outside, the old rules remained.” What was meant by that? In their partnership, the two men treated each other as human beings and with respect. On the outside, they did not socialize and Thomas was in a subservient role. See Comprehension Test/Homework Assignment Questions 8 and 9. 1. Dr. Blalock and Mr. Thomas were a team. What would have happened if either of them had not pulled his weight in the team effort? Many of their discoveries would not have been made or would have been made later by others. No questions. The message of the movie on this topic is so obvious it doesn’t need any explication. 2. One would think, that after working together for decades Dr. Blalock and Mr. Thomas would be friends. Were they? Describe the reasons for your answer. No. They were not friends because Dr. Blalock kept Mr. Thomas in a subordinate position and didn’t invite Mr. Thomas to important social occasions, such as the large party thrown for Dr. Blalock. 3. What was the most important way in which Dr. Blalock failed to treat Mr. Thomas as a friend? Friends nurture each other. This would have meant that Dr. Blalock would have helped Mr. Thomas go to college and medical school so that he could become a surgeon. 4. Was it Mr. Thomas’ obligation to support his family or Dr. Blalock’s need for him in the laboratory or was it something else that prevented Mr. Thomas from returning to college and then going to medical school? From the standpoint of Dr. Blalock’s responsibility as a friend to Mr. Thomas, does the answer matter? See Question # 10 in the Comprehension Test/Homework Assignment. 1. Assignments, Projects, and Activities for Use With Any Film that is a Work of Fiction. 3. Have students reproduce one of the illustrations or drawings of the operation linked in the adjacent Photographs, Diagrams and Other Visuals section of this Guide, describing the purpose of each incision and medical device shown. Hopkins pioneered ‘blue baby’ surgery 50 years ago from the Johns Hopkins Gazette. 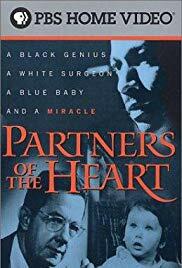 Partners of the Heart — Vivien Thomas and His Work with Alfred Blalock — An Autobiography by Vivien T. Thomas, 1985, University of Pennsylvania Press, Philadelphia. Was Dr. Blalock a racist or a man who did as much as he could to help Mr. Thomas have a fulfilling career? There is no one right answer to this question. We tend to take the more charitable view of Dr. Blalock’s actions. A good answer will refer to the facts that: (1) Most white doctors in the South in the 1930s and 40s would not have trained a black man with only a high school education to become a full-fledged participant in pioneering scientific research. In addition, Mr. Thomas was treated with respect in many other ways. He was, for example, allowed to use the same toilet as all of the white lab workers and doctors. (2) However, Dr. Blalock did not treat Mr. Thomas as an equal beyond the walls of the laboratory or operating room. He did not give Mr. Thomas credit for his work in the scientific community. He did not invite Mr. Thomas to social gatherings. He did not encourage Mr. Thomas to attend college and then go to medical school. Dr. Blalock did not pay Mr. Thomas a salary commensurate with his work. In these respects, Dr. Blalock took advantage of the color of Mr. Thomas’ skin. (3) We must be careful not to judge Dr. Blalock by current standards. After he retired in 1963, there was a major shift in thinking about racism and the rights of black people, particularly in the South. podunk, traumatic shock, pulmonary artery, carotid artery, subclavian artery, clavicle, saturation, desaturation, concussed, cyanotic, blue baby syndrome, tretrology of Fallot, young blood, induce, menometer, respirator, congenital, malformed, written off, suffocating, blockage, surgical solution, ventricular defibrillation, bureaucratic details, fistula, disease model, constrict, medial, lobes, adhere, oximeter, promoted, shunt, stenosis, kink, blood vessel, continuous suture, interrupted suture, pharmaceuticals honorary doctorate, gratifying, limelight. Article on Dr. Taussig from Deaf Friends International. The Blalock Clamp for the temporary occlusion of the pulmonary artery, devised for Blalock’s use by Vivien Thomas and William Longmire, working with the local surgical supply house Murray Baumgartner & Co.